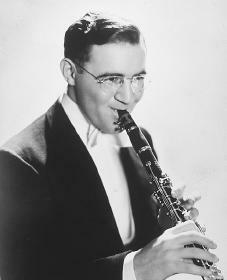 Benny Goodman was a great jazz clarinet player and the leader of one of the most popular big bands of the Swing Era (1935–1945). In fact, Time magazine dubbed him "the King of Swing." an imitation of the popular Ted Lewis. So impressed was bandleader Ben Pollack that five years later he sent for Goodman to join his band in Los Angeles, California. After three years with Pollack, Goodman left the band in New York City in 1929 to make it on his own. In 1934 he led his first band on a radio series called "Let's Dance" (which became the title of Goodman's theme song). The band also played at dance halls and made a handful of records. In 1935, armed with songs developed by some of the great African American arrangers, Goodman's band traveled the country to play their music. Not especially successful in most of its performances, the band arrived at the Palomar Ballroom in Los Angeles in a discouraged mood. The evening of August 21, 1935, began coolly. Then, desperate to wow the unimpressed audience, Goodman called for the band to launch into a couple of fast-paced crowd pleasers, and the reaction ultimately sent shock waves through the entire popular music world. Hundreds of people stopped dancing and massed around the bandstand, responding with enthusiasm. That performance turned out to be not only a personal triumph for the band, but for swing music in general. Goodman's popularity soared; the band topped almost all the magazine and theater polls, their record sales were huge, they were given a weekly radio show, and they were featured in two big-budget movies. But an even greater triumph awaited—a concert at Carnegie Hall in New York that was to win respect for Goodman's music. The night of January 16, 1938, is now famous; the band outdid itself, improving on recorded favorites such as "King Porter Stomp" and "Don't Be That Way." The band finished the evening with a lengthy, classic version of "Sing, Sing, Sing." Two of the finest musicians ever to work with Goodman were pianist Teddy Wilson (1912–1986) and vibraphonist-drummer Lionel Hampton (1909–2002). However, they played only in small-group arrangements because of the unwritten rule that did not allow white musicians and African American musicians to play together. Goodman was the first white bandleader to challenge segregation (keeping people of different races separate) in the music business, and as the rules eased he hired other African American greats. Many top-notch musicians joined and left Goodman's band over the years, more so than in other bands. Most musicians found Goodman an unfriendly employer. He was said to be stern and stingy with money. Moreover, Goodman was referred to in music circles as "the Ray," because of his habit of glaring at any player guilty of a "clam" or "clinker" (a wrong note), even in rehearsal. An outstanding clarinetist who was equally at home performing difficult classical music, Goodman was not very patient with anything that was not technically perfect. After 1945 the clarinet was pushed into a minor role in bebop music, the new style of jazz that was becoming popular. Goodman struggled for a while to accept the new music, but in 1950 he decided to dissolve his band. From that time forward his public appearances were rare. They were mostly with small groups and almost always for television specials, recordings, or European tours. His most celebrated tour, however, was part of the first-ever cultural exchange with the Soviet Union. In 1962, at the request of the U.S. State Department, he went to the Soviet Union with a band. The trip was a smashing success and greatly helped American jazz become popular in Eastern Europe. After his marriage in 1941, Goodman's home was New York City. His wife, Alice, with whom he had two daughters, died in 1978. Goodman maintained his habit of performing on occasion. In 1985 he made a surprise and, by all accounts, spectacular appearance at the Kool Jazz Festival in New York. He died the following year of an apparent heart attack. Goodman's ultimate contribution to jazz is still being debated. Much post-1940s jazz criticism has judged him to have been over-rated compared to other jazz greats. Nonetheless, Goodman's technical mastery, polished tone, highly individual (and influential) solo style, and undeniable swing certainly have earned him a permanent place in jazz history. Collier, James Lincoln. Benny Goodman and the Swing Era. New York: Oxford University Press, 1989. Connor, D. Russell. Benny Goodman: Wrappin' It Up. Lanham, MD: Scarecrow Press, 1996. Firestone, Ross. Swing, Swing, Swing: The Life and Times of Benny Goodman. New York: Norton, 1993. Goodman, Benny. Benny, King of Swing. New York: W. Morrow, 1979.